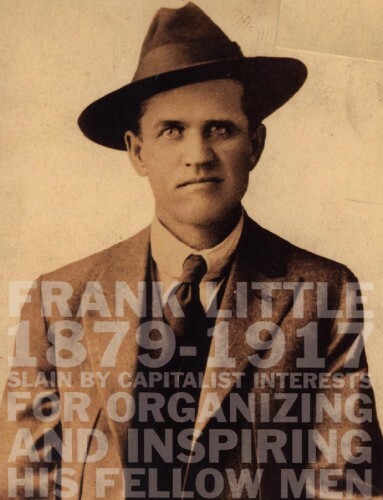 Icarus Films recently released (on DVD) AN INJURY TO ONE, Travis Wilkerson's 2003 documentary about the unsolved murder of union organizer Frank Little in early-20th century Butte, Montana. Wilkerson, a socially conscious filmmaker--he has been called "the radical Ken Burns"--has dug deep into the contemporary history of Butte to tell his story. The discovery of copper deposits in the 1890s put the town on the map; three mining companies fought for control of those lucrative deposits. The competition gave Butte's 6,000-odd miners a little wiggle room; they were able to organize and form a powerful left-wing union, the International Workers of the World, better known as the Wobblies. The IWW obtained decent salaries and working conditions for the miners, but when Anaconda Copper bested its competitors and turned Butte into a closed shop, the Wobblies were crushed after a series of brutal, bloody battles involving the state militia, scabs and the Pinkerton Detective Agency (one of whose agents was Dashiell Hammett, who later wrote a crime novel about his class-war experiences in Montana, Red Harvest). When WW I broke out and the price of copper skyrocketed, Anaconda began taking profits in the hundreds of millions out of Butte. The company also ceased going underground to dig for copper, opting instead to strip-mine it; the pit they gouged out eventually resembled one of the Great Lakes. Working conditions were abysmal here, safety a joke: mortality rates were higher than on the battlefront in Europe. The Wobblies sent Frank Little to Butte to try and rally the miners and assist them in launching a strike against their rapacious bosses. Little made a couple of brave speeches, only to be kidnapped and lynched a few days later; his murder was only cursorily investigated and remains unsolved to this day. The whole sorry story of how Anaconda Copper raped and plundered Butte (the company bailed out in the 1980s, leaving behind a toxic lake and mountains of smouldering rubble) is capsulized in AN INJURY TO ONE. Wilkerson used archival and current footage, intertitles, traditional mining songs and original music by the likes of Will Oldham and Jim O'Rourke to put his one-hour film together. The result is one of the most hard-hitting and uncompromising documentaries ever made.